My Slow Cooker King Ranch Chicken Soup is a classic, comforting casserole in soup form. A cheesy, tomato soup base is spiked with chili powder, garlic and cumin and studded with diced chicken and tomatoes and then showered with your choice of delicious toppings. We’re sick. Again. Since we moved this summer, we’ve had colds, our very first ear infection, a round of hand foot and mouth and now another round of colds. We’ve never been this sick and I’m totally blaming it on the altitude and new climate. Everyone says their first year here they were sick frequently and it looks like we’re following suit. Being sick calls for soup, or at least it does in my book. So a huge batch of Slow Cooker King Ranch Chicken Soup, was just what this mama ordered! 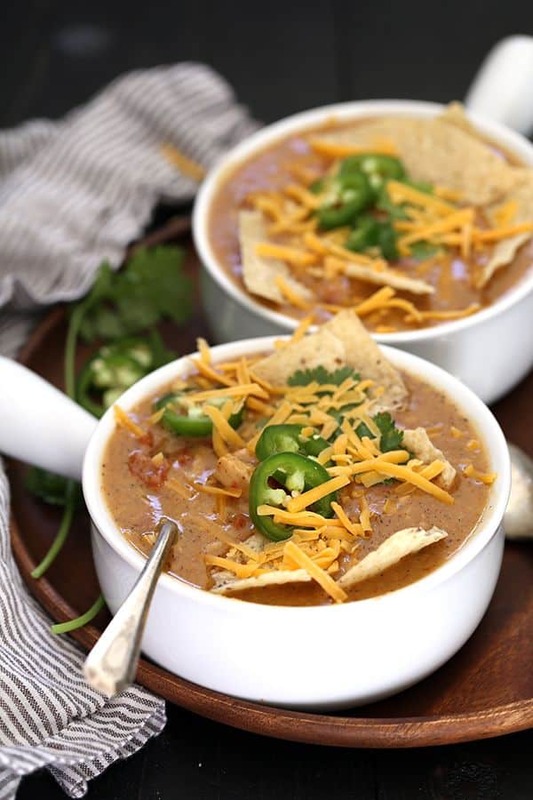 This soup came straight from fellow blogger, Samantha Skaggs at Five Heart Home‘s, new book Real Food Slow Cooker Suppers. As the name implies, all of the recipes call for all real, fresh, unprocessed ingredients. Each family friendly main dish recipe includes a full page, full color photo for every recipe. Because you eat with your eyes first, right? 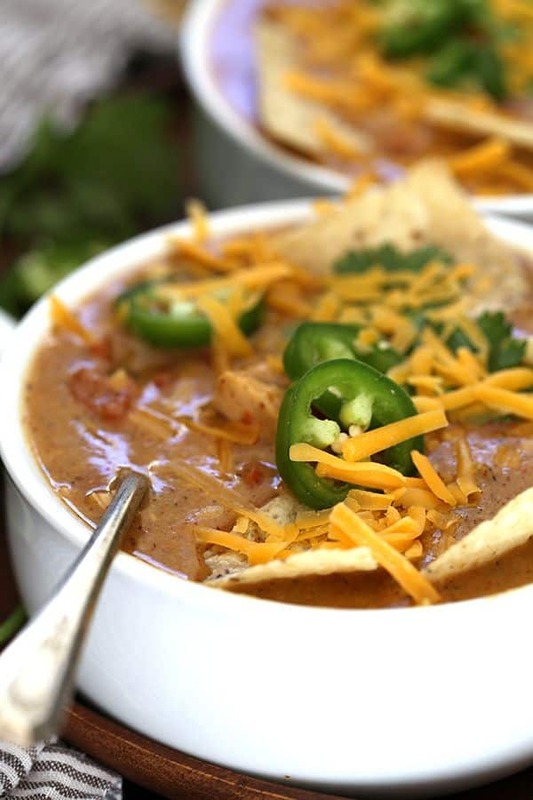 King Ranch Chicken Soup is a take on a classic, comforting casserole of the same name. To me, it’s a cross between chili and a chicken soup. So pretty much two delicious bowls of goodness, combined into one. A tomato base is spiked with chili powder, garlic and cumin and studded with diced chicken and tomatoes. After being slow cooked to perfection, sharp cheddar cheese is stirred in before the soup is ladled into bowls. That’s where good gets even better. Toppings! Tortilla chips, fresh jalapeño slices, additional cheese and plain yogurt or sour cream is added and you’re left scrambling for your spoon so that you can start enjoying as soon as possible. The original Slow Cooker King Ranch Chicken Soup recipe was so delicious that I only made one teeny, tiny change. Samantha’s recipe called for one diced jalapeño within the soup which I omitted knowing that it might cause resistance among my four small children. Instead, I saved the jalapeño for the topping and my husband and I enjoyed several slices in our bowls as the contrast of the creamy soup and crunchy peppers was delicious. I did make two additional changes that were totally personal preference. One, I doubled Samantha’s recipe. Even though the recipe says it would serve six, I could tell that there wouldn’t be enough for anyone to enjoy seconds. Good call on my part as my husband enjoyed three bowls – he’d been on call all day and was starving! – and I enjoyed two. Our four children also each enjoyed at least one ladle full and I only had a quart jar of soup left to enjoy for lunch the next day. I also chose to make the entire soup in my slow cooker rather than starting it on the stove as I didn’t want any additional dishes to wash. Tell me I’m not alone on this one! My slow cooker not only is a slow cooker but it also browns and sautés and can even steam as well. It also is non-stick which means it’s an absolute breeze to clean. Knowing this, I could make the entire recipe from start to finish and only have the slow cooker crock to rinse out at the end of the night. 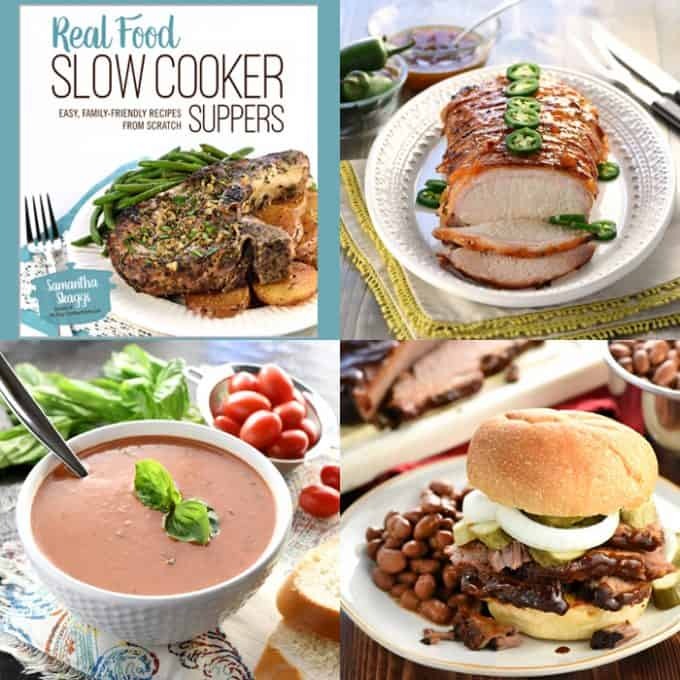 Armed with this information, I can guarantee you’ll also love my extremely popular Slow Cooker Lemon Rosemary Lentil Soup, hearty Slow Cooker Mediterranean Beef Stew and classic Slow Cooker Chicken and Wild Rice Soup. In a six quart slow cooker, melt butter. Add garlic and stir until fragrant. Stir in flour and whisk continuously until smooth. Slowly stir in chicken broth until combined. Add chili powder, cumin, garlic powder, salt and pepper and stir to combine. Add chicken breasts and top with diced tomatoes. Cook on LOW 4-6 hours or until chicken is cooked through. Remove chicken and dice. Return to slow cooker and stir in cheddar cheese. Allow to thoroughly combine and warm through. 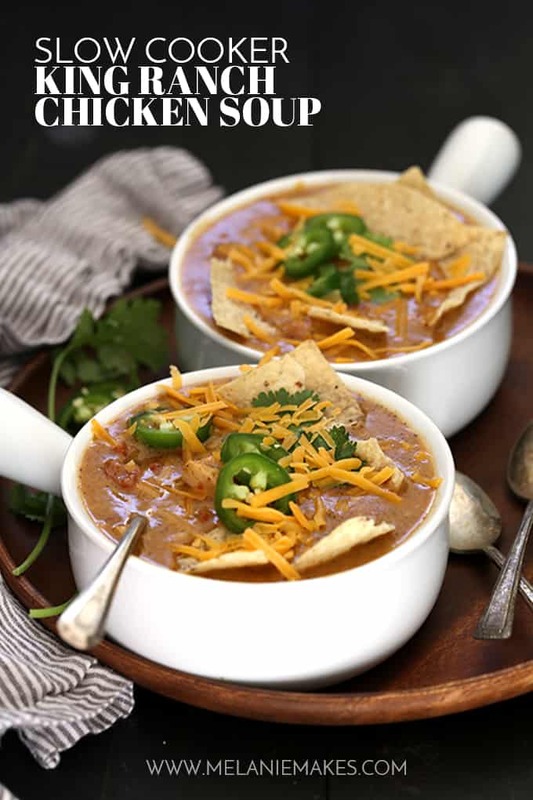 Serve soup in bowls garnished with tortilla chips, chopped chilantro, jalapeno slices and plain yogurt. If your slow cooker does not have the ability to saute, you'll want to complete the first four steps of the recipe in a saucepan on your stovetop and then add it to your slow cooker. Adapted from Real Food Slow Cooker Suppers by Samantha Skaggs. 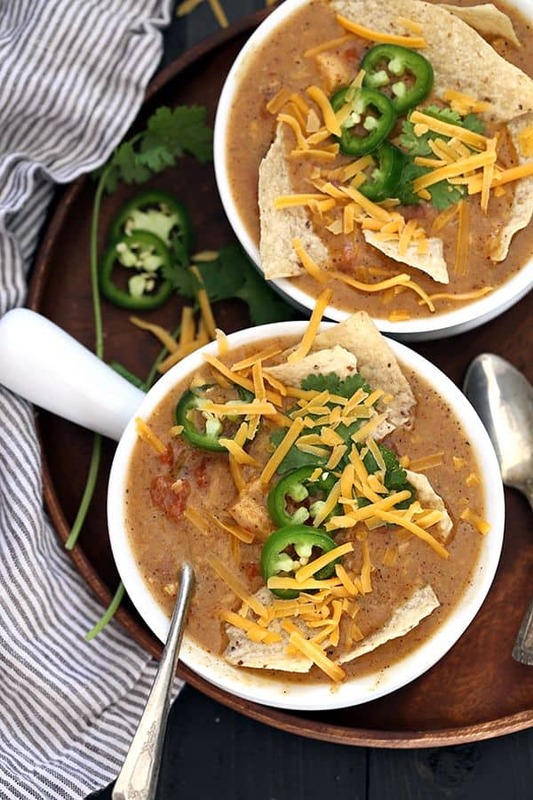 Wanting to add a few more slow cooker soups to your arsenal? Check out this simple Slow Cooker Broccoli Cheddar Soup, this healthy Slow Cooker Vegetable Barley Soup or hearty Slow Cooker Busy Day Potato Soup. This looks SO flavorful! I'd love a bowl right about now!! Such a great way to warm up on a snowy day! This was a perfect dinner last week when it was soooo cold outside and everyone loved it!! So happy you enjoyed it, Steph! How hearty this soup looks! This is exactly what I need during this cold season! This a tasty easy recipe to make! Perfect for this time of year! This was an easy recipe to prepare. Everyone loved it. I would definitely use this again. So thrilled you enjoyed it, Chrissie! That's amazing, I would love to try making this someday! I'm sure you'd love it, Ken! You are so kind, Samantha - thank you! It's definitely a new favorite for our family! King Ranch Chicken is one of my absolute favorites! This soup was such a hit at our house, Brandy! This soup looks absolutely FABULOUS! I love all the flavors going on here....I must make it! Thanks so much, Cathy - it's definitely a new favorite! What an amazing soup!! Its perfect for fall!! *spiked* *studded* and *showered*...I am ALL IN! You're the best, thanks Dorothy! 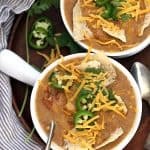 Wishing for cooler temps to make some of these soups!! Our record highs of 90+* do not scream big pots of hot soups and home made bread!! Did you find removing the jalapeños and using them as a topping cut out the heat enough that little ones would eat it? I made the original version of this before and it was to die for but my 19 month old and 4 year old found it a bit too spicy. I didn't know if it was both the rotel tomatoes/chiles and the jalapeños or just the jalapeños. Thanks for sharing! Love your blog! Hi, Alyssa - Yes, with using the jalapenos as a garnish only for my husband and I (my 8yo also was okay with them), my three other children didn't have a problem at all with the heat. Thanks so much for your kind words and for trying this recipe! 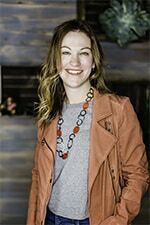 I definitely have to try this for fall. 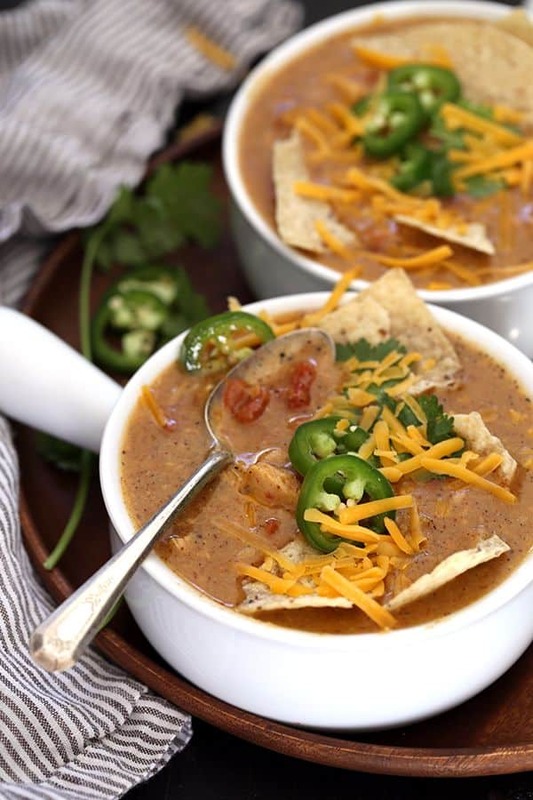 I love a good slow cooker soup!